For our longer road trips, I pack a surprise bag that the kids LOVE. Depending on how long the trip is, I announce that I’ll be giving surprises at even intervals, such as every hour. We set the timer on one of our phones, and when the alarm rings, everyone is so excited for the next surprise! Mentally, this keeps the kids looking forward to the time passing as part of the trip, and helps keep them entertained. Don’t get me wrong, there is nothing lavish in this bag, but I do keep it full of things the kids don’t normally have access to, such as a new activity book, a DVD from the library they haven’t seen before, a road trip game we can play together, or a fun snack they might not normally get at home. Sometimes I bring silly things, like clown noses or stick-on mustaches and challenge the family to see who can wear theirs the longest. Whatever you do, make sure the very first prize you disperse is this claw toy. This gives a surprising amount of entertainment, and saves us moms from constantly picking up dropped items on the ground. As our kids get older, it is a huge help to supply a paper map from a rest stop and mark out the trip along the way, noting the milestones. A little technology also goes a long way on this front, because my kids absolutely love mapping out our long trips and seeing our progress in real time. I used to be all about the destination instead of the journey – we’d eat in the car, stop only for emergency bathroom trips, and even traveled by night at times to make good time. It was a recipe for very irritable passengers! Over recent years, I learned the error of my ways. 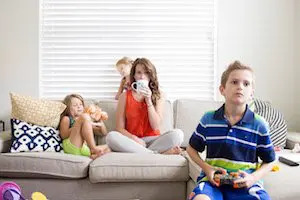 I’ve found that the more we plan to stop regularly along our journey, whether it’s a sit-down lunch or stopping at a playground or fast food play land, the more fun everyone has along the way. The more you can turn the road trip into part of the vacation, instead of the drudgery bookending the trip, the better! 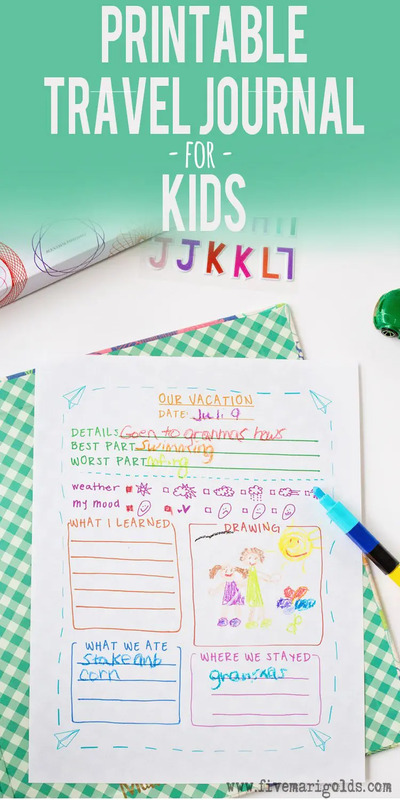 Another idea to keep kids occupied is a travel journal, where they can document these fun stops along the way. 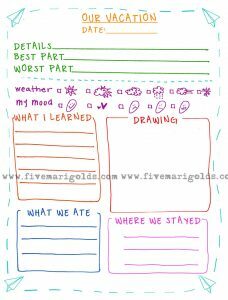 I print these kid-friendly templates and put them in a binder for them to log each day of our vacation. We plan to add to this journal each year, so we can reminisce past vacations. 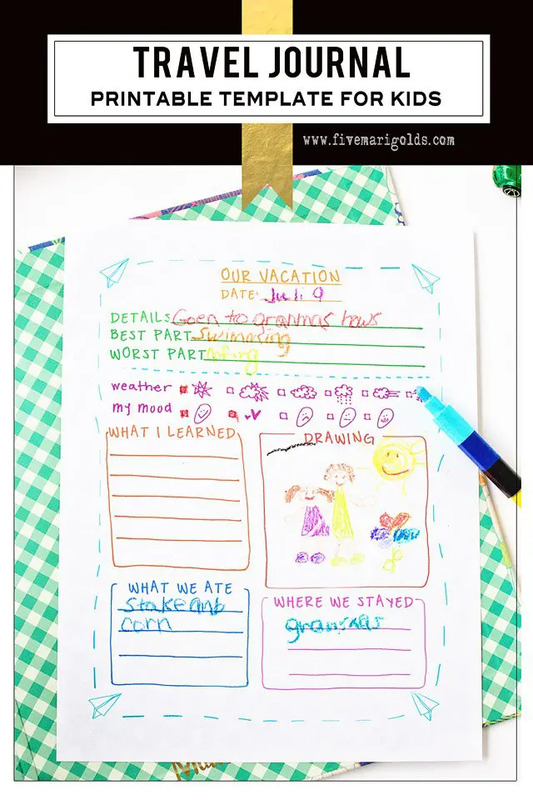 Keep on reading to get a FREE copy of my travel journal template for kids, at bottom of this article! A road trip is simply a long drive if you don’t have fun snacks along the way! To keep expenses down, we try to shop for most of the snacks and drinks before we leave, and keep them in a cooler. 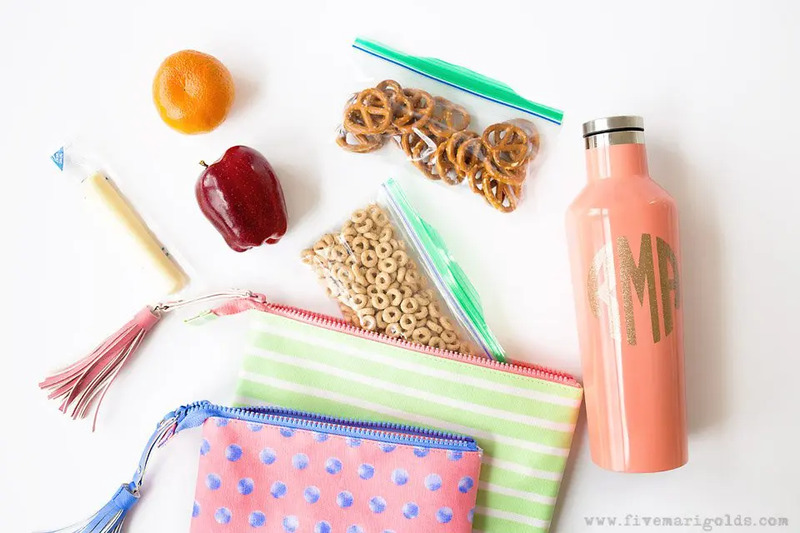 Road trip snacking with kids can be a messy proposition, so I always bring lidded cups, pre-portioned baggies and baby wipes to keep things as clean as possible. Of course, spills are inevitable, so I also pack rags or paper towels, as well as plenty of plastic bags from the grocery to use as our trash bags on the go. Since space is at a premium on long car rides, it’s important that your in-car items are stored smart. For example, give each child their own backpack so they can easily access and neatly contain their toys, electronics and a few snacks. While you’re at it, add a few grocery sacks so they will be more likely to contain their garbage along the way. Packing a blanket for the journey? 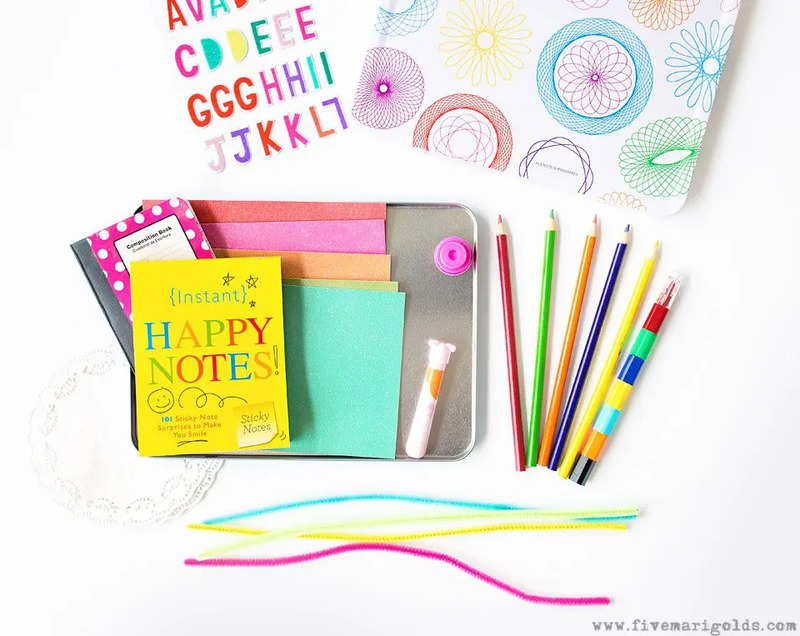 Make use of the under utilized space below your seats (if you have it) or, roll it up, loop it under the backpack straps, and tighten them all the way to keep it in place. 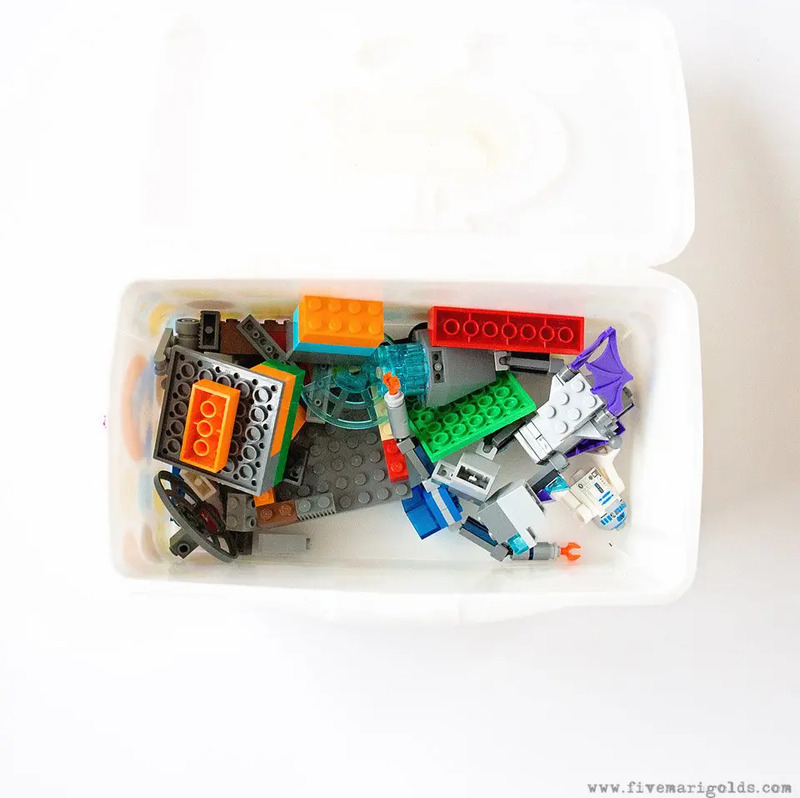 When packing small toys like Legos or small crafts, use an empty container of baby wipes as a storage and play container. 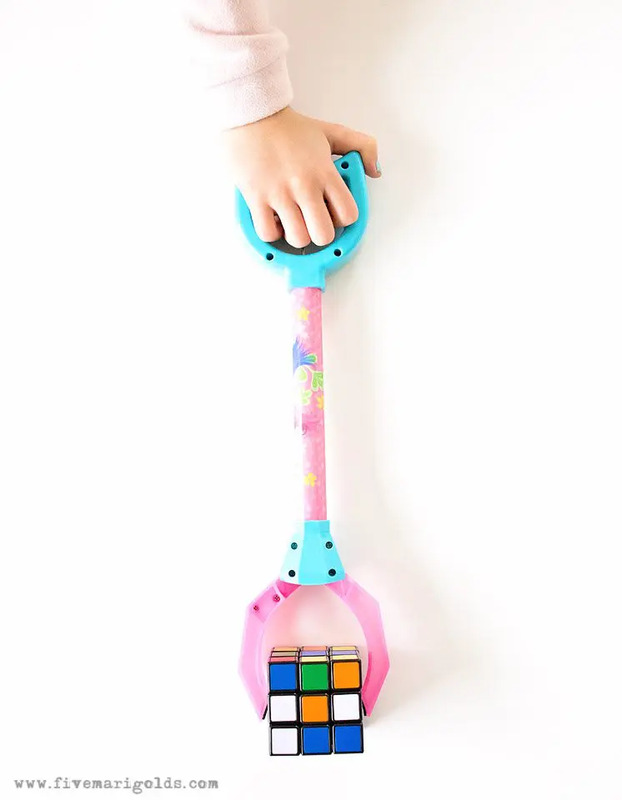 Not only does it enable your kids to play with small items without losing them, but in a pinch, it can quickly be opened wide open, emptied, and used in the event of car sickness. NOT THAT I WOULD KNOW. Of course, safety is the most important part of any road trip. Be sure to pack a kit with the prescriptions your family takes, pain reliever, motion sickness medication, tissues, and bandages. It’s important that all car maintenance is taken care of before you depart, and the necessary emergency car kit is packed. One thing that most people don’t think to do is to change their cabin air filter each year. Did you know that the air inside your vehicle can be up to 6x dirtier than the air outside? Our FRAM Fresh Breeze® cabin air filter filters up to 98% of dust, dirt and allergens than outside the car. It was simple to install – Mr. Marigold removed the glove compartment and replaced the filter, sliding it right in. To find out if your car has a cabin air filter and find the right one for your make and model, visit the FRAM website, then pick up your filter at Walmart. (Follow recommended change intervals as noted in your vehicle owner’s manual). 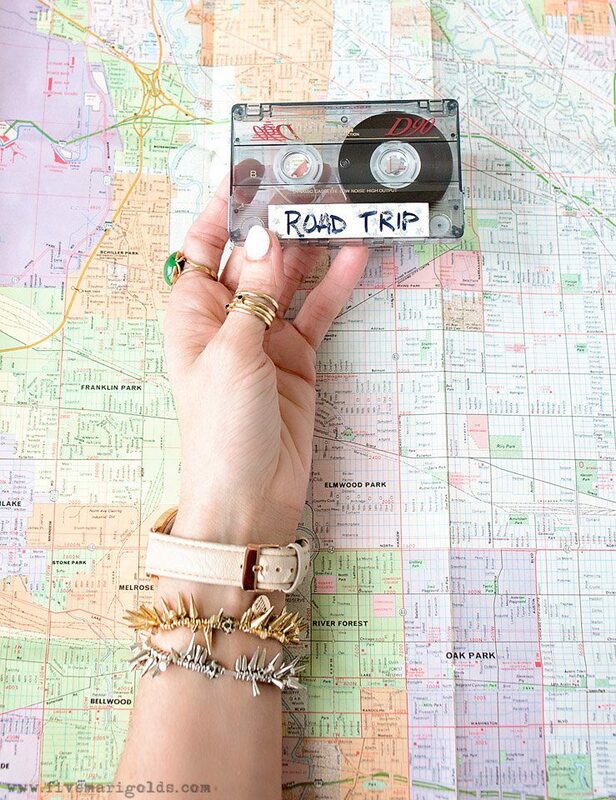 Looking for more road trip hacks? You can find even more great ideas here! 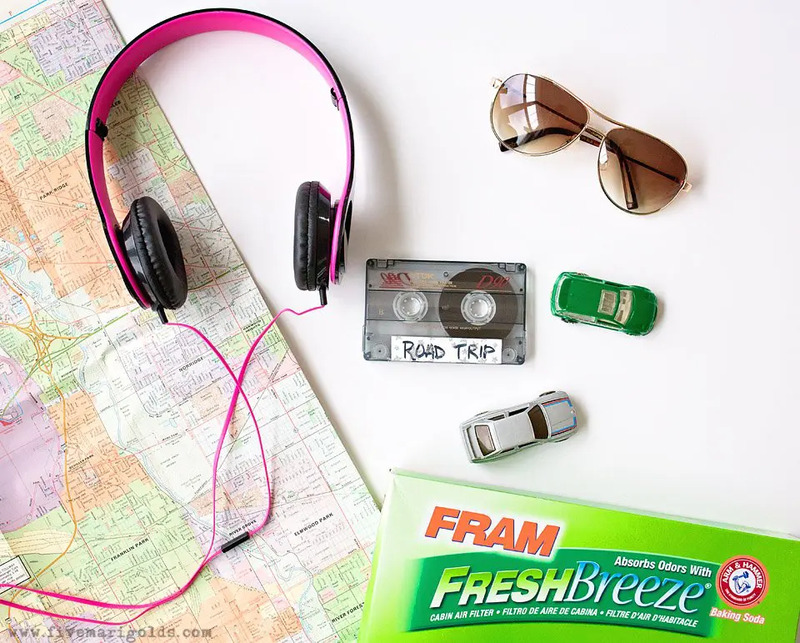 Do you have any road trip hacks you’d add to this list? Please tell me in the comments below! 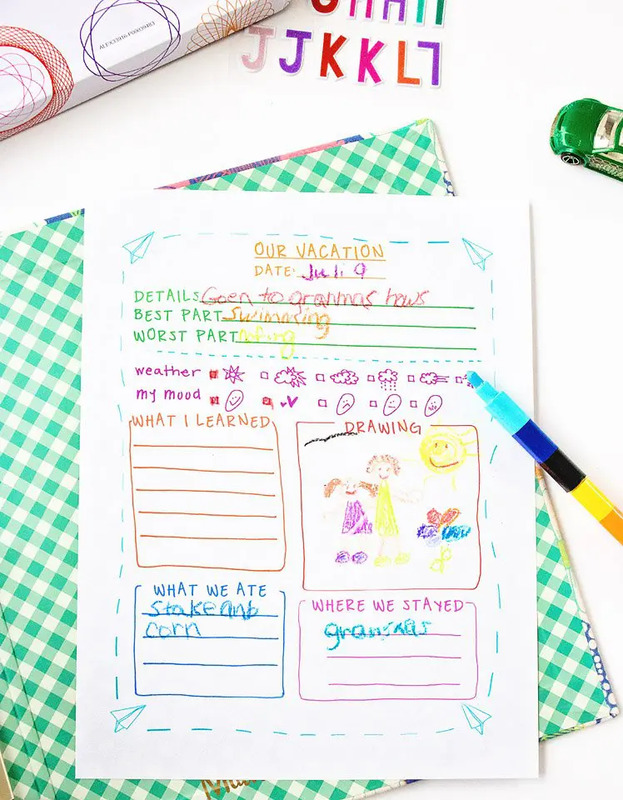 Then, download your FREE printable Travel Journal Template for kids HERE. 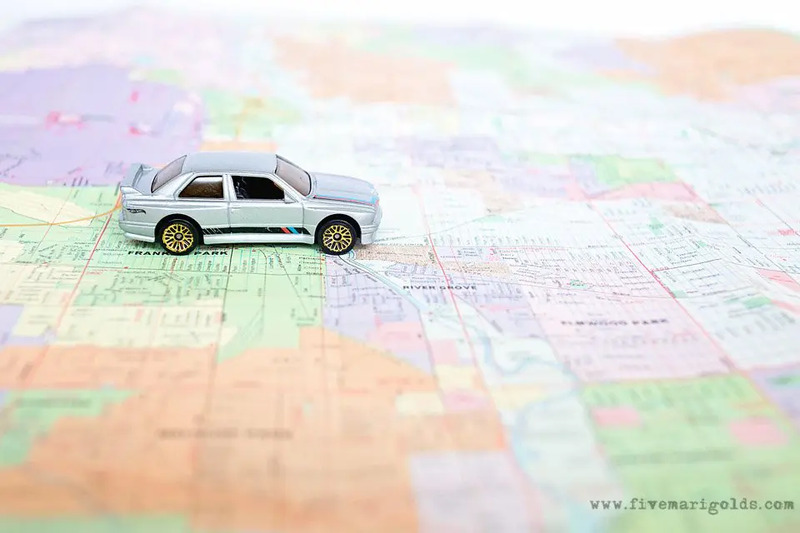 Your paper map idea is genius! We’ve never done that and my son would love it! What great tip! 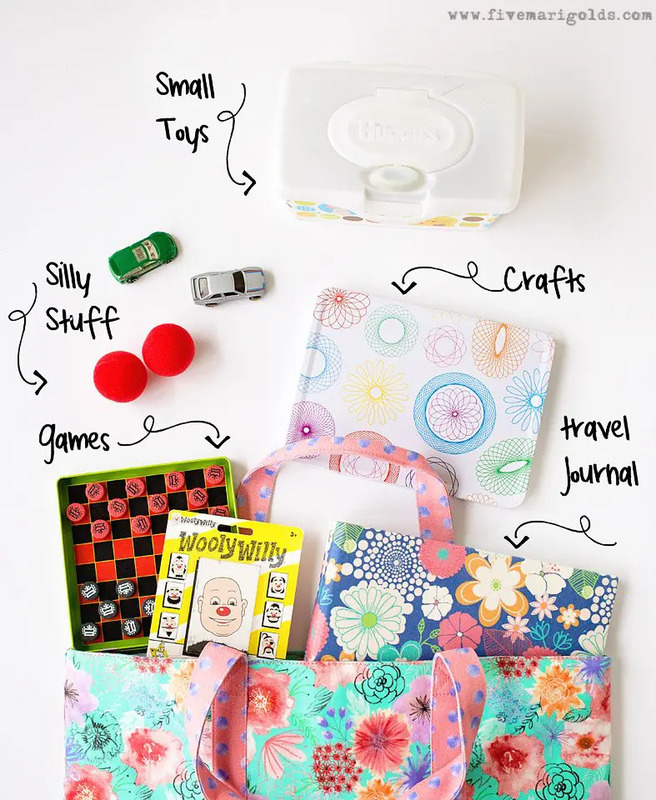 I love the travel journal- awesome idea! I really love this…thanks for sharing!